I know today is one of the most busiest days for Hindus. 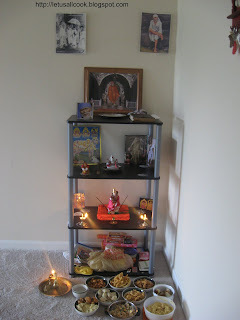 Doing Pooja, cleaning house and decorating Lord Ganesh! I know there is a lot of work. But when you do all these with love, you will never feel tired. This is what happened with me. Today my day started at 9.00AM. After packing lunch for my husband, I started to clean the house. My house was so clean that I had to spend 3 hrs cleaning!!! Then I took my bath and started preparing the Prasadams. I know its too early, but I had a lot to do. Starting at 1.30PM I first prepared the savories, then the sweets. At 5.00PM got dressed and decorated Lord Ganesha and started my Pooja. After 1 hr of Pooja, I am now free to write about my day as a post. Happy Vinayaka Chaturthi to all! Check out my Recipe Index for all the above recipes. Hmm... it took around 3.30hrs for me to prepare all the above items from the scratch. Pretty tiring, but I enjoyed preparing them. I'll post all the recipes soon. Once again Happy Vinayakar chaturthi! Happy Vinayaka Chaturthi to you too Sangeeth! Looks like you made a lot of savouries. Yum! Happy Vinayaka Chathurthi. What a spread. Very tempting. We make only the Vella and Uppu Kozhakkatai. 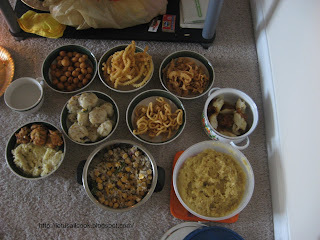 Cheedai is for Gokulashtami for us.